Fresh Vermont butter toffee dipped in milk chocolate and rolled in crushed almonds and cashews makes this classic butter crunch a perfect topping or as a afternoon treat. Crisp and buttery, just melts in your mouth!The mouth-watering flavor is irresistible, with just-made toffee centers, dipped in milk or dark chocolate, then rolled in freshly roasted crushed cashews and almonds. Every piece is made from scratch with award-winning "Best of Class" Vermont Cabot Creamery butter. 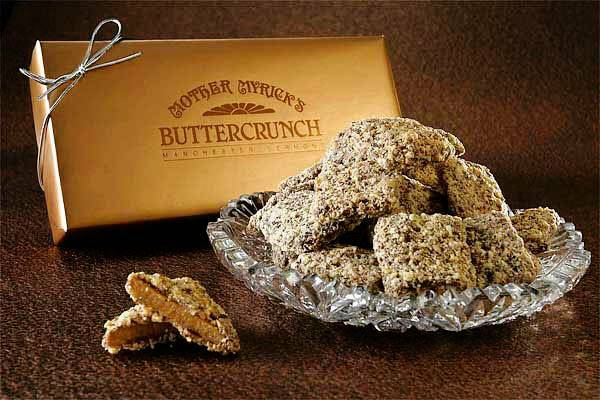 Order enough for everyone - Buttercrunch is hard to share!